Avocados, a great source of mono-unsaturated fats, vitamin B and potassium, can moisturize the skin and act as an exfoliating mask for dry skin. Whole fruits and vegetables, especially those with anti-aging vitamin C, can fight free radicals, prevent wrinkles and give you firmer, younger-looking skin. Yogurt contains lactic acid, a compound found in some chemical peels that may reduce fine wrinkles and help clear blemishes and discoloration. Brown sugar grains help exfoliate skin for a healthier glow. 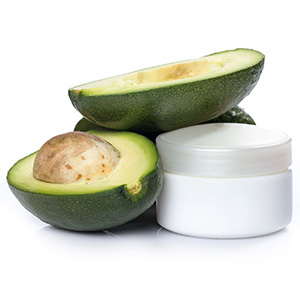 Avocados, a great source of mono-unsaturated fats, vitamin B and potassium, can moisturize the skin and act as an exfoliating mask for dry skin. Green tea has tannins and anti-inflammatory compounds to reduce skin puffiness and provide antioxidants to fight against premature aging. Try the following natural treatments and see the changes in your skin. Mix Greek yogurt, almond or olive oil and honey; apply to face, leave on for 20 to 30 minutes; then rinse and pat dry. Pulse dark brown sugar in a coffee grinder to make it finer and less abrasive on the face (do not grind if using on your body). Add olive oil for extra moisture and, if you want, a pinch of nutmeg for fragrance; stir until it forms a paste. Wet your face, apply scrub in a circular motion for 1 to 2 minutes; wash off with warm water. Use this treatment twice a week. Mix together all ingredients and apply liberally to face. Leave on for 15 to 20 minutes; rinse with warm water. Use twice a week for softer, healthier skin. Chill damp tea bags and put on eyes for 10 to 15 minutes. Joanne Henning Tedesco is editor of AzNetNews. Reprinted from AzNetNews, Volume 33, Number 1, February/March 2014.